Mud gas separators are commonly used during oil drilling operations, particularly in situations when extraction is likely to yield a large volume of gas. Mud gas separator captures and separates large volume of free gas within the drilling fluid. If there is a “KICK” situation, this vessel separates the mud and the gas by allowing it to flow over baffle plates. The gas then is forced to flow through a line and vent it to a flare. The mud gas separator skid may include one or more fluid conduits for use with a drilling rig, including an integrated vent line, a high pressure line, a low pressure line, a standpipe manifold, a rig water supply line, a diesel line, an air line, and a rig water return line. 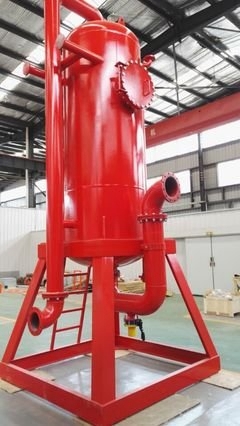 The integrated mud gas separator skid may be mechanically coupled to a drilling rig. The integrated mud gas separator skid may need only one crane lift to be mechanically coupled to the drilling rig. DC Solid control can supply the model of DCZYQ800, DCZYQ1000 and DCZYQ1200 mud gas separator. If you have any requirements please feel free to contact us.